Is this an overwintering queen and if so what species. 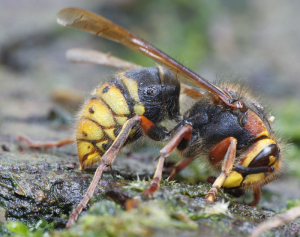 was slightly larger than a normal wasp but substantially smaller than a hornet. actually found a hornet not far away. have some video of both the hornet and this wasp as they were both slightly moving in the 4C temperature but does not really help with ID.